Before Christmas I didn’t even know I need such an Amazon Dot, now I use it all the time! It’s relatively easy to set up, I was soon up and running. However I am still learning about the more advanced features. It works with Alexa voice recognition and the Alexa app – which integrates well with other things. If the voice recognition mishears you, you can try again (with different words) and give feedback via the app. 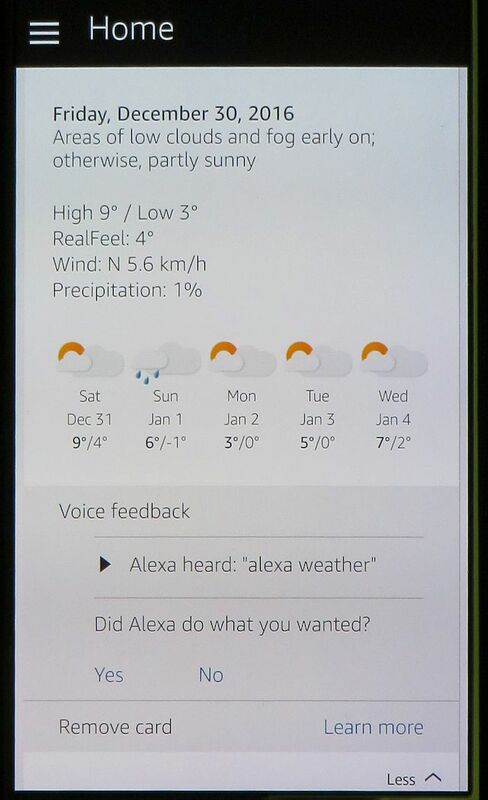 In less time than it takes to get my phone out, I’ve asked my Echo what the weather forecast is, and what my commute is like. The Echo reminds me of appointments, and I can dictate items on shopping lists whenever I spot I’m running out of something. It’s turned my elderly HiFi into a voice operated Internet radio. As I happen to have a Nest thermostat, I can also ask my Echo to ask it to turn the heating up or down. As soon as smart light bulbs become cheaper, I’ll be telling it to turn the lights on and off! I’ve only had it a few days, but I can see that using it with If This, Then That (https://ifttt.com) I will be able to use it with all sorts of things. It would be particularly useful for people with failing vision, for instance you can turn a radio on and select stations purely by talking to it. It amuses me how many say they can’t see the point of such a device. I remember when TV remote controls first became available, my parents were shocked that people would be too lazy to get out of a chair to change channels. I suspect many of us wouldn’t be without our TV remotes and predict that devices like this will soon be thought of as indispensable.